I’m Cristina Vee, and for the past few months I’ve been recruiting talent, scheduling actors, and directing the voiceover sessions for Skullgirls. You may have heard my voice in anime or other games, such as K-On!, Tekken: Blood Vengeance, BlazBlue and Sakura Wars. 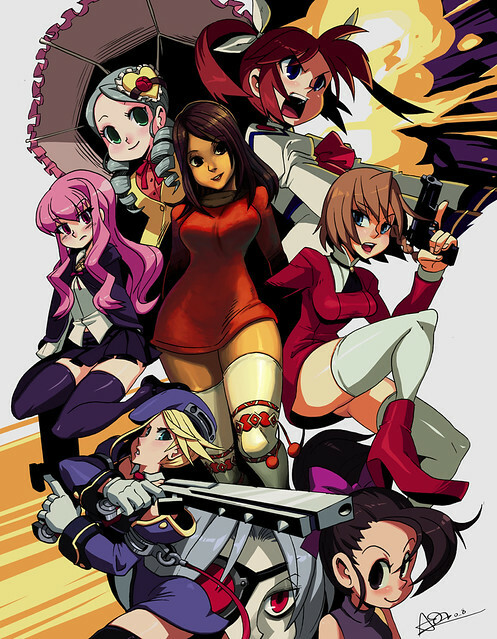 Alex Ahad, Skullgirls’ art director, made this excellent montage of some of the characters I’ve voiced! These past couple of weeks have been really exciting for Skullgirls, have they not? I was able to check out the display at E3 (what a great show!) and it’s so great to see how everything is coming together. I played a couple of rounds of the game, as well… Okay, so I lost every time, but Mike Z is going to train me soon and I will hopefully not embarrass myself like that again! Anyway, it was really great to receive honest feedback about the character voices, especially since we still have a long way to go in the recording process. Voiceover! It is without a doubt my most favorite thing in the world. Other favorites of mine are video games, comic books, and movies. I love that Skullgirls‘ dialogue and animation constantly references nerd culture (believe me, you will be surprised! ), but my favorite thing about the project is that the people who work on it have so much passion for what they do. Have you read the other blogs?! Thus far, we have recorded voices for three (and a half?) playable characters. I know many people are curious about how the recording process goes, so I’d like to briefly walk you through one. First and foremost, auditions are held, using a short script the team creates with a handful of lines that define the character. I send this script around to potential voice actors, who send back a recording of their sample. We are very lucky to have auditioned some of the most talented and prolific voice actors in Los Angeles. Finding the right voice is so important: it is the final element that brings a character to life, the visual design, animation, and sometimes music. A voice that doesn’t sound quite right can pull the player out of the experience. I listen to every audition and sometimes give the actor feedback for adjustment, but the final decisions are made by the team at Reverge Labs. After the cast is chosen, we pick a day to record and schedule time in a recording studio, or “booth” as it’s called in industry lingo. In addition to myself and the actor, Alex and Richard from the Skullgirls team show up at the booth to help manage the session. Alex makes the final creative decisions, and Richard shows me and the actor videos of each move to help get the perfect read of each line. Most of the time the script isn’t ready early enough for the actor to see it before they enter the booth, and that’s just the way it goes with most projects. As soon as we arrive, I prep the actor with their character’s story and play back their audition, and then it’s go time. It is my job to provide the actor with context, keep them “on voice,” and make sure the read matches the animation, among other things. The actor has the real work here, of course. We record each line separately and ask the actor for “three in a row.” The actor will read the line three ways in three different times and Alex, Richard and I will decide which read we like the most. If the actor is off the mark, I’ll adjust them accordingly and ask them to give us a couple more. Because this is a fighting game, the voice work here can be very strenuous on the actor’s voice. The majority of the lines are attack calls, grunts, and yells, all of which must be delivered with a lot of energy. To protect their voice and to make sure they can give us the best performance possible, we make it a point not to keep the actor any longer than two hours per session. Our scripts are pretty long, too – there are usually more than 200 lines, and thus far we’re finding that it takes two full sessions to record the whole thing. When we’re done, the recorded lines are handed over to the team, who do any further processing like Peacock’s voice filters, and hook them up in the game. We record so many variations that the team can give the character alternate reads for all lines that go with normal attacks. And for the basic movement, attack and hit grunts, there’s an entirely separate set of variations for Player 1 and Player 2. Some other fighting games do this, and it helps make the voices distinct even in mirror matches, since you hear the grunts more than anything else. As the voice director for Skullgirls, I’ve been really impressed and inspired by the commitment and professionalism of our actors. I find myself continually wanting to jump out of the directors chair and into the booth with them. I did get to jump in the booth, by the way: I’m the voice of Cerebella. So, like I said before, we’ve only just begun this amazing, fun, magical process. If there are any fun stories or outtakes, I’ll be sure to let you in on them. Until then, I’ll be enjoying watching the development of Skullgirls continue. Just wait for the encore!